Imagine living in your very own sanctuary in the heart of Charleston, South Carolina, but stepping out your front door into modern urban life. Many believe that �anyone who really likes to be in the center of things� would appreciate the penthouse at 18 Broad St. Designed by Victor Frohling in 1911, it recently was restored. 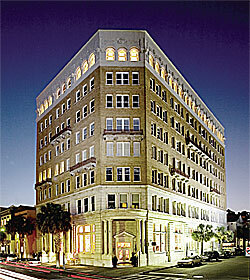 Though it is now a luxurious 21st-century �smart house,� it has maintained its historic standing in downtown Charleston. Under current restrictions, Charleston residential buildings cannot exceed four stories, but 18 Broad has eight floors, with a 3,177-square-foot penthouse on the fifth. �Being on this floor gives you a whole bird�s-eye view of the city because everything else is much lower,� says Jennifer, adding that along with views of the entire historic district, you can see water from every room of the penthouse. The residence has a security system based on fingerprint recognition and Lutron blinds controlled by touch screens. Other features include ebony-stained planked flooring, a marble fireplace, mahogany bookcases and a custom-built entertainment system wired for broadband Internet, Surround Sound and a flat-screen television. The bathrooms feature Oceanside Glasstile and Carrera marble vanities. The kitchen has custom cabinets by JMO Woodworks, a 36-inch Wolf range and a Sub-zero refrigerator with a glass door. © 2019 SouthCarolinaCondoLiving.com, South Carolina Condos for Sale. All Rights Reserved. Site design and maintenance by Media Services.